Coffee, a drink to many, an elixir to others. A cup can be the thing that starts your morning, the kick you need to get through work, or just an invitation for a date or a chat with friends. The truth is that coffee is so much more than just a beverage, for a lot of people is part of a culture, a way of life. Growing up in Melbourne you learn to appreciate a good coffee from a dangerously young age. You believe that this is standard in all cities, well until you travel. You have that first coffee that costs €5 from a cafe using an automatic machine. This experience will most likely bring a tear to your eye. However, after all my travels of Europe, Dublin brings the caffeine goods to the table. There is a group of people dedicating themselves to providing amazing coffee to the people and I am bloody impressed. Here are our favourite coffee shops in Dublin. For anyone who loves coffee, finding a perfect cup in a new city can prove to be hard coffee is so much more than a drink. Brewing great coffee is an art. 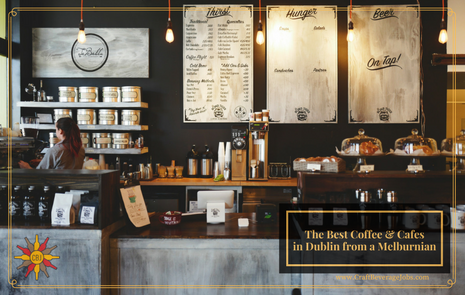 If you are in a city like Dublin is important to have some guidance, so you know not only where to get a warm coffee but where they make a superb one. So whether you are taking a quick work break, or getting the caffeine fuel to kick off your day, here are some places you have to visit around town. A staple for coffee lovers in the city, 3FE has been making waves since it opened it’s doors in 2009. The Owner Colin Harmon, who won the Irish Barista Championship and has competed around the the world, decided it was time to set up a shop. However, 3FE is more than a coffee shop, this is an experience. With beans coming from Nicaragua, Bolivia, Colombia and Costa Rica, these guys not only serve good coffee, they are offering some of the best around the world. They supply it to most of the great cafés around town (they were also included in the list of coffee shops to see before you die. If you want a coffee adventure, try a coffee trio or a filter tasting, you can even get an espresso tasting! This place is a hit with Dubliners. Known to many as the perfect brunch spot, they also make amazing coffee. In fact, that cup of coffee is part of what makes their breakfast so great.Their secret? Outstanding blends (their coffee is from 3FE) and head barista Bruno Ferrer, running the caffeine pipes around this place. For those latte or flat white fans, get a Milky (they have a choice of soy or oat milk for vegans), if you want to try something different, ask for the Single Origin Filter Coffee. Looking for those instagram worthy lattes? Then head on to Beanhive on Dawson’s. Street, they are famous for their coffee art (seriously, you can get a tiger, a boat, even a monkey design in your coffee) and they taste pretty good too! Drop by and try their Roasted Hazelnut Latte (they also have non dairy options for the milk), or for a bit of a kick, get the Orange Ginger Cappuccino. Located on Meath Street, there is the treasure known as Legit. This is a trendy coffee shop, that looks like it would fit in within the pages of any design magazine. It’s a calm atmosphere and a place where you can enjoy your coffee (and their famous homemade sausage rolls), knowing that whatever you get will be made with love. If you get a chance try the batch brew, it will be worth it. For those who love espressos and filter coffees, you are in for a treat at Two Fifty Square. It is one of the best coffee shops in Rathmines. It has made a name for two things: great food & superb coffee. They roast their own blends, and for the filters you get a choice between aeropress or v 60. Try their Ethiopian or Kenyan mixes, they are out of this world. Amongst Dublin’s foodies and coffee lovers, Fumbally needs no introduction. This café is everything you want your coffee shop to be, simple yet incredible, memorable yet affordable. Here’s a cup of coffee, that will not only warm your body from a cold Dublin morning, it will get to your soul. Author: Brittnay is an Aussie who lived in London for the past two years before making the move to Dublin. She managed to squeeze in 21 trips to Europe & Africa in that time (including lots of cheese, wine & coffee). Her adventures of travel and house sitting is captured.